New functionality simplifies management and distribution of millions of files for financial institutions including hedge funds, banks, dealers and exchanges. MONTREAL – July 11, 2016 – TickSmith’s TickVault Platform has been enhanced with File Inventory, a module for managing and distributing large quantities of data files from multiple sources. Large financial data producers and consumers such as exchanges and trading groups already use TickVault to accumulate, centralize, analyze and distribute Terabytes and Petabytes of brokerage data. 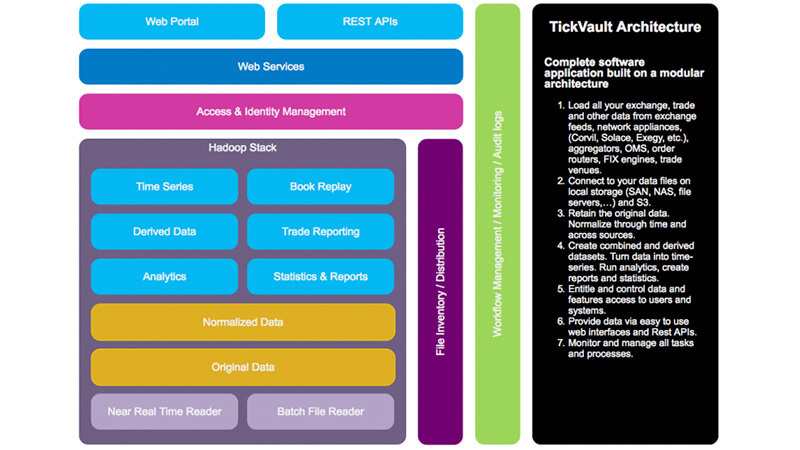 In its standard configuration, TickVault normalizes and combines data from various sources, runs out-of-the box and custom analytics and provides web storefronts and self-service portals to employees and users as well as seamless integration with in-house applications through Rest APIs. “While working with stock exchanges and hedge funds to manage trade, quote, and reference data with TickVault, we realized that many of our customers were struggling with millions of accumulated files,” said Tony Bussieres, SVP Development of TickSmith. Part of the TickVault Platform, File Inventory works with files on servers, SANs and storage on cloud such as S3. The module inventories and catalogues files to create file profiles. Content can be searched, subscribed to, and accessed via web interfaces and APIs. Delivered as a complete solution, File Inventory is installed in a client’s data center or AWS instance. TickVault is a comprehensive platform used by trading and risk groups, regulators, exchanges and data vendors who need to accumulate, transform, analyse and disseminate Terabytes and Petabytes of financial data from quote feeds, trading systems, event feeds and more. With specialized tools and modules, TickVault provides easy access to files, data, analytics, time-series, workflow and reports via point and click interfaces and APIs. TickVault is deployed on a firm’s Hadoop cluster and in the cloud on AWS.